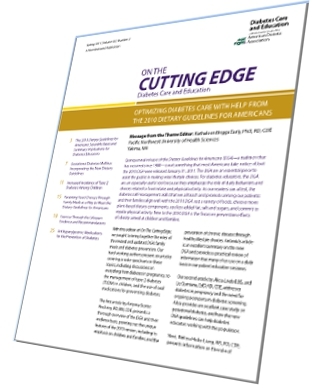 Thank you for your interest in our popular newsletter On The Cutting Edge (OTCE). DCE members can access all issues of OTCE as part of their membership. OTCE is an educational peer reviewed publication for DCE members, published 3 times a year (Spring, Summer and Winter). Each issue has several articles one a single topic. DCE members can complete the associated quiz online and receive CPEU free credit (usually between 3 and 5 credit hours) for each issue. You can see the table of contents and a few select articles from our most recent issue. OTCE is primarily for DCE members. It is one of our most valued member benefits. Non DCE member registered dietitians (RDs) are not allowed to purchase it. However, we do allow those who are unable to join DCE because they are not registered dietitians (RDs) to purchase individual issues and earn CPEUs or to have a subscription (without CPEUs). If you are an RD and not yet a member of DCE, we hope you will consider joining DCE. In addition getting all 3 issues of OTCE (with free CPEU credits available), DCE has many other benefits, including a very active listserv, another great newsletter (NewsFlash), and discounts on webinars. If you are already a ADA member, DCE membership is only $30, the same cost of a single issue of OTCE.